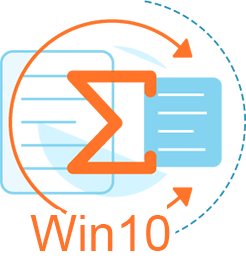 EffectiveSoft, Ltd. offers a new document analysis service for Windows 10 available on PC, tablet, and smartphone. Software developed by EffectiveSoft, Ltd. uses a proprietary linguistic platform IntellexerTM to analyze documents, extract the main ideas and put them into a short summary. A short overview of the source document generated by Intellexer Summarizer as well as Named Entities and Concept tree help to understand what the document is about without going into the details. Intellexer Summarizer caters for a broad range of people from students to analysts and researchers. The service helps to decide quickly if the text is of interest and if the user needs to go into a deeper analysis of this text. The first step is to choose the source for summarizing – a URL, clipboard content, document or a search result. To summarize a URL specify the web address under Options -> URL. 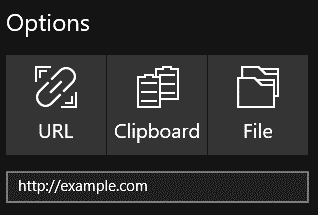 To summarize a clipboard content click the button “Clipboard”. The last text you copied will be summarized. To summarize a document click File and select a document on your computer. 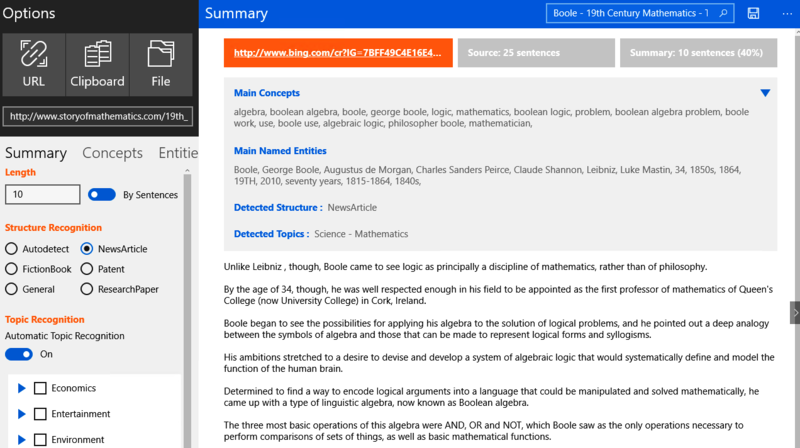 Summarizing a search result is a new function available on Intellexer Summarizer for Windows 10. Now search on the Internet can be done without leaving the App. A search query can be entered in the search field on the top right of the screen. In order to summarize a search result, click on the link you are interested in. Please, note that web pages very often contain a lot of irrelevant information like menus, site navigation, ads, article announcements which may influence the summary, that's why developers recommend copying the article content to the Clipboard and only then summarizing it in the program. The length of the summary can be adjusted. It can be done both before and after creating a summary. The length can be defined either as the number of sentences or as a percentage of the original text. The structure of a document is specified automatically or can be chosen manually before creating a summary. Manual structure detection activates special algorithms that take into account the peculiarities of the chosen structure type. Intellexer Summarizer can automatically detect the topic(s) of the text using the integration of machine learning approach with extensive built-in ontologies. However, it is also possible to choose the topic(s) manually in order to receive a summary that covers the selected topic(s) to a greater extent. Alongside the summary, Main Concepts and Main Named Entities will be displayed as well as the automatically detected Structure and Topics. The source text after summarizing a URL or a search result can be seen by clicking on the link in the orange box. 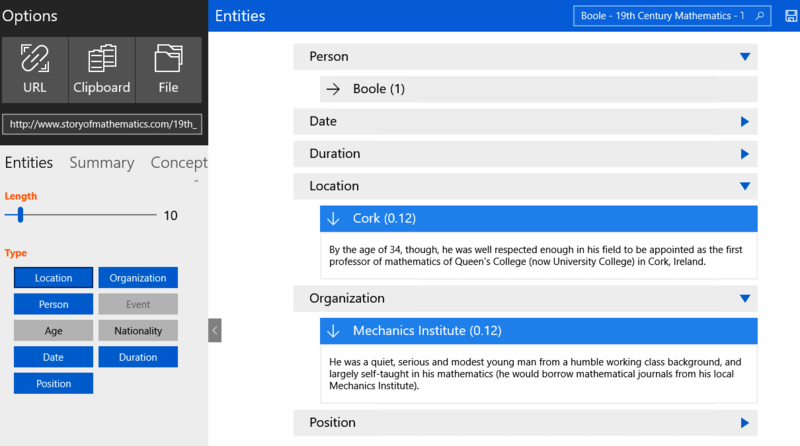 Concepts tab shows main concepts of a document displayed as a Concept Tree. A concept represents a relevant term or a phrase, which conveys a key notion in the source document. 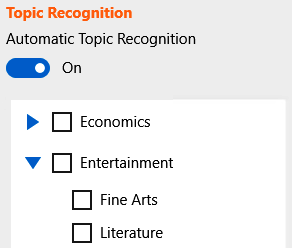 According to a number of parameters, such as the occurrence frequency in the text, topic, etc., a certain relevance weight is assigned to each concept. Concepts are grouped based on the class-subclass relation (Algebra – Boolean algebra, Linguistic algebra) and presented in the tree-like form. It helps to better understand the idea of the original text and decide whether this text suits the user’s needs. Under each concept, a list of facts where the concept was mentioned is shown. The number of submitted concepts can be adjusted by the slider. All the Named Entities extracted from the text can be viewed in the Entities tab. Summarizer recognizes 9 types of Named Entities (names of Persons, Organizations, Locations, or Events, as well as Positions, Age, Date, Duration, Nationality). The Named Entities are hierarchically organized by types and relevance weights. A list of facts where the Entity was mentioned is shown under each Named Entity. The number and types of submitted entities can be adjusted. 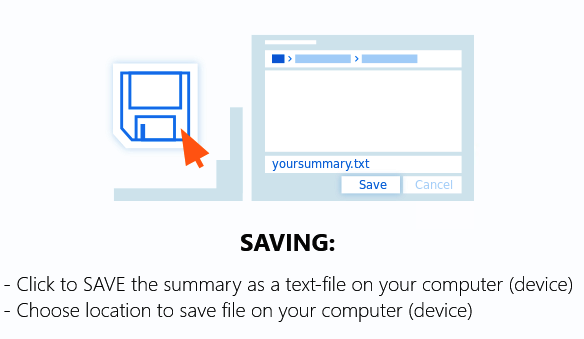 To save a summary click on the Save icon in the upper right corner and specify the location. 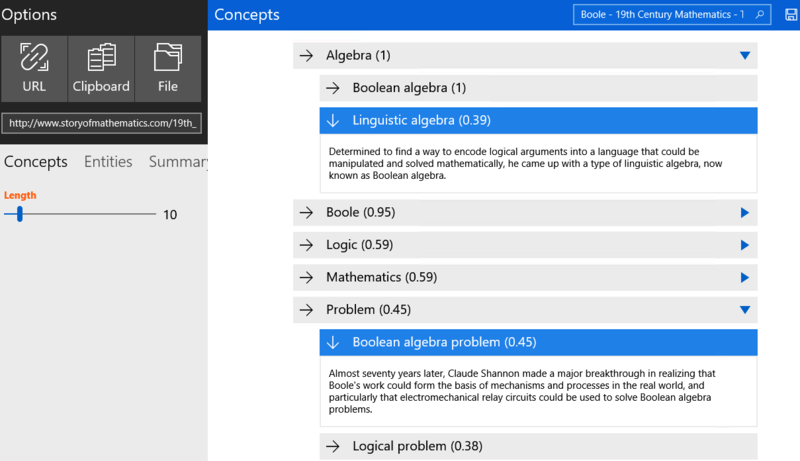 Intellexer Summarizer for Windows is a new document analysis service which can be used on PC, tablet and smartphone. Powered by artificial intelligence, Intellexer Summarizer will get the main ideas of the text just with one tap. Try Intellexer Summarizer for Windows 10 right now under the 30-day free trial to know how Summarizer can solve your tasks.